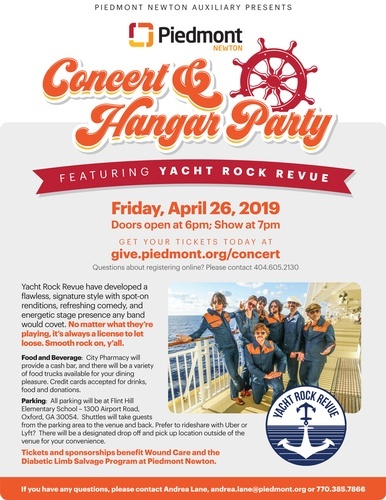 Join us for our first ever concert and hangar party at the Covington Municipal Airport on Friday, April 26, 2019 featuring Yacht Rock Revue! Generous donations and event sponsorships will help expand the services available at Piedmont Newton, and benefit our community by providing the most advanced techinques and interventions to the patients we serve. Yacht Rock Revue have developed a flawless, signature style with spot-on renditions, refreshing comedy, and energetic stage presence any band would covet. No metter what they're playing, it's always a license to let loose. Smooth rock on, ya'll!